Media centers based on Realtek RTD1295 or RTD1296 processors have been around for a few years. They usually run both Android and OpenWrt operating systems for respectively media functions (4K video playback, HDMI input recording…), and NAS functions like file sharing. media downloads, etc…. SinoVoIP also unveiled Banana Pi BPI-W2 board powered by RTD1296 last year, but so far I was not aware of any source code for the target. Synlogy actually released a Linux 4.4 tarball a while ago, but more recently SinoVoIP released Linux 4.9.119 and U-boot source code for RTD1296 in Github. You’ll find instructions to build from source, and flash the resulting U-boot and Kernel image from the Github page. There’s also some mainline Linux support for RTD1295, but maybe this release will help further speed up mainline support. There are four DTS files which normally describe boards listed with RTD16xx processor: Realtek_Mjolnir_2GB (with or without NAND flash), Realtek_Rescue_1GB, and Realtek_Thor_FPGA. 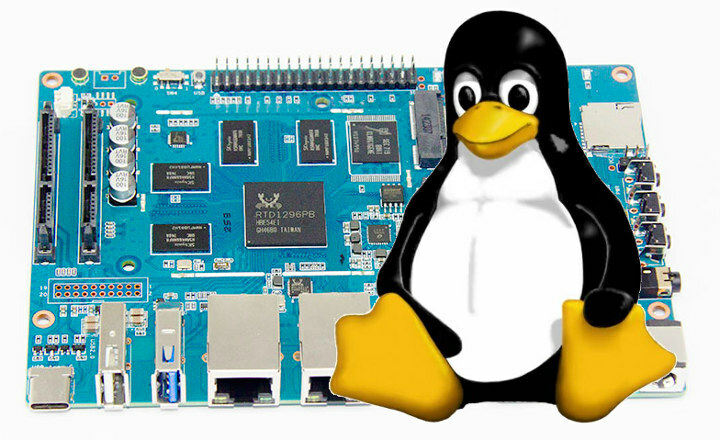 So Banana Pi BPI-W2 can now boot Linux? Any reviews of this board to be seen? Pretty good I/O on this board! See http://forum.banana-pi.org/c/Banana-pi-BPI-W2 — for whatever bizarre reasons no one is testing what this device will be bought for. LOL! BPI folks as usual tried to come up with a funny design. If they would’ve used 3 x mPCIe you could’ve done an awful lot more things with the two PCIe lanes. And then of course their support and documentation monkey does not write correct documentation or answers questions correctly but simply throws out BS again and again: http://forum.banana-pi.org/t/banana-pi-bpi-w2-with-realtek-rtd1296-chip-design/3924 (still ‘Cortex-A5’, ‘Realtek 1296 documents download link’ shows MediaTek R2 stuff; ‘sata , it is use PCIE interface’ –> BS, SATA is native here… and so on). It’s great (for Banana Pi folks) that they openened up the sources now instead of playing their usual ‘just wait and see’ game for more months so that interested community members can now start to help them (as it happened with every other board so far — I really don’t get it why they repeat every mistake over and over again). But as long as they don’t hire a technical writer and start to care about ‘information’ being correct and not just random words and numbers assembled to funny sentences there’s still a lot of room for improvements. tkaiser, do you have some info on why orange pi guys didn’t release their rtd1296 board (orange pi R2) ? Orange Pi R2 shall be avaialble next month, now we are testing the wifi, when it is solved, we could arrange the sales. LOL! I’m so stupid. Back then when looking at the Orange Pi PCB I thought Xunlong wouldn’t make any use of PCIe lanes. But on the OPi R2 the RTL8822 PCIe chip BPi folks sell as an add-on card is already on the PCB to provide Wi-Fi and BT.